UPDATED: Tue., Sept. 5, 2017, 7:55 p.m.
FORT LAUDERDALE, Fla. – Hurricane Irma’s size and strength put the entire state of Florida on notice Tuesday, and residents and visitors prepared to leave in anticipation of catastrophic winds and floods that could reach the state by this weekend. 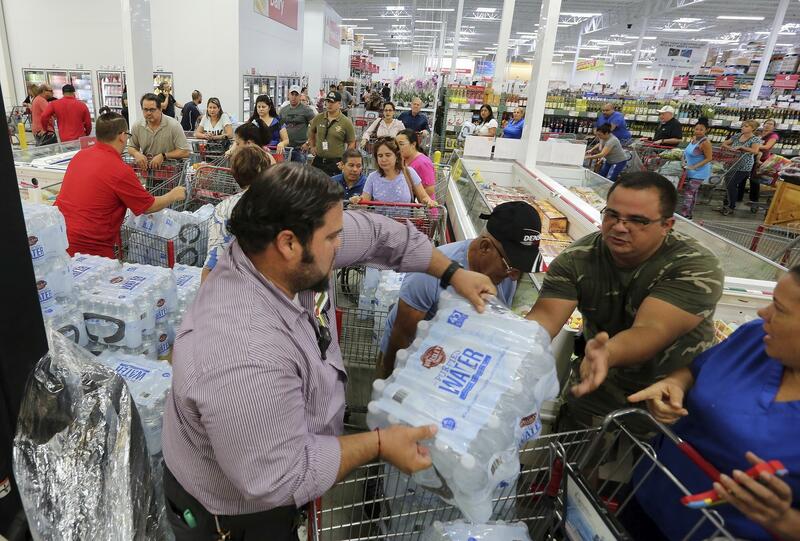 Throughout South Florida, officials readied evacuation orders and people raided store shelves, buying up water and other hurricane supplies. Long lines formed at gas stations and people pulled shutters out of storage and put up plywood to protect their homes and businesses. Parker Eastin filled up his gas tank at a busy fuel station. He and his girlfriend said they decided to plan well in advance after seeing what Hurricane Harvey did to Texas. Irma’s winds were 185 mph Tuesday, a strong Category 5 storm, and forecasters say it could strengthen more as it neared the eastern-most Caribbean islands, according to the National Hurricane Center in Miami. The storm had the most powerful winds ever recorded for a storm in the Atlantic Ocean and posed an immediate threat to the small islands of the northern Leewards, including Antigua and Barbuda, as well as the British and U.S. Virgin Islands and Puerto Rico. The last major storm to hit Florida was 2005’s Wilma, its eye cutting through the state’s southern third as it packed winds of 120 mph. Five people died. Florida Gov. Rick Scott declared a state of emergency in all 67 counties to give local governments “ample time, resources and flexibility” to prepare for the storm. President Donald Trump also approved a federal emergency declaration for the state ahead of the storm, according to the Federal Emergency Management Agency. Scott warned that although officials don’t know the storm’s exact path, winds are likely to be “extreme and life-threatening” and the impacts could be felt inland, away from the coast. He said Floridians need to follow any evacuation orders. In the Florida Keys, a chain of 42 low-lying islands that includes Key West, government officials said visitors would be told to leave Wednesday and residents should be out by the next day. “This is not one to fool around with,” said Monroe County spokeswoman Cammy Clark, whose county contains the Keys. Under a mandatory evacuation order, no one is forced by police or other government agencies to leave, but anyone who stays should not expect to be rescued if they are in danger, officials said. The island chain has only one highway connecting it to the mainland. Keys residents are famous for riding out hurricanes, but Randy Towe, who owns a recreational fishing company in the Keys, said Irma is different. “I’ve talked to a lot of Conchs (Keys natives) whose families have lived here a hundred years, and they say this certainly might be a big one,” said Towe, who has lived in the Keys 36 years. He said owners of large boats secured them in canals by tying them to mangrove roots. Smaller boats were put on trailers and into storage. He plans to evacuate with his family if Irma’s forecast doesn’t change. In Key Largo, Janet Roberts, 51, was getting ready to leave her mobile home community Thursday for her daughter’s house 30 miles away in Florida City, which is the first city north of the Keys on the mainland. “She lives in a complex and has hurricane shutters. At least we stand half the chance,” she said. She remembered how much damage Hurricane Andrew caused when its eye passed just north of Florida City in August 1992. The deadliest storm to hit the Keys struck on Labor Day 1935. More than 400 people died in winds estimated at 185 mph and a storm surge of 18 feet. Bridges and railroad beds were washed away, cutting off the middle and lower Keys except by sea and air. In 1960, Hurricane Donna hit the Keys on Sept. 10 with sustained winds of 140 mph and storm surge reached 13.5 feet. Four people died. On the Florida mainland, Miami-Dade County Mayor Carlos Gimenez urged tourists to cut their vacations short and said residents may be asked to leave as early as Wednesday. “The potential is too great for us not to take action right now,” Gimenez said. Publix, the state’s largest grocery chain, said its South Florida stores were packed with customers and bottled water was in particular demand along with bread and canned goods. “Even as the aisles are emptying, we are trying to replenish as quickly as possible,” spokeswoman Maria Brous said. Published: Sept. 5, 2017, 2:01 p.m. Updated: Sept. 5, 2017, 7:55 p.m.